I’m very excited about this beer for a few reasons. First, this is my first lager (properly done), and second, I get to utilize a new piece of equipment, my brew jacket. I am a lager FIEND. I love love love lagers and this is starting off a hopefully continuous line of lagers stretching off into the future. 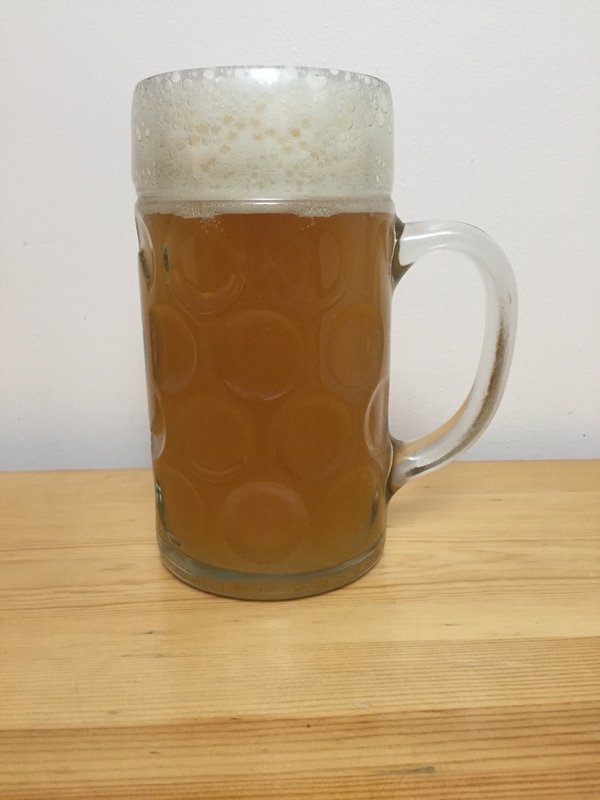 I decided to start out simply and make a Helles. One of my favorite “tests” of a new brewery is to try their simplest lager. Like drawing a circle, it is deceptively simple and you cannot hide a single mistake. If I can brew a variety of naked lagers, I will know that I am a good brewer…at least something like that. So a quick note about lagers versus ales. When I was first learning about beer the thing I would hear all the time is that lagers are bottom fermented and ales are top fermented. I think this is basically something people say…a better way to describe it is that lagers and ales are fermented with a different species of Saccharomyces…in addition to the different species, the process of making a lager is different in that it is lagered….or cold aged. There is a perennial debate about the origin of the Saccharomyces pastorianus species but I believe it is relatively settled that it is a hybrid between S. cerevisiae and S. eubayanus at this point. There is a lot of molecular evidence that this is the case at least. 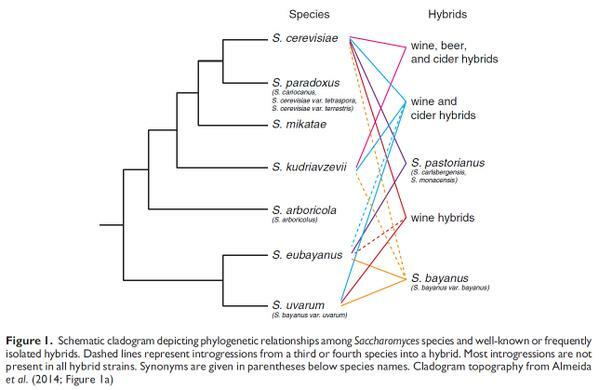 I’m writing a post slowly about different species of Saccharomyces and how to tell who is who and what is what….expect that later this year. For now, this is the graphic I think is most valid. I am not going to put this in the same bucket as my S. paradoxus beer I made last year as being another yeast species since it is the most common yeast species to make beer…just wanted to point out lagers are different because they use a different species for fermentation. Now, onto the beer. First lager, going to keep it simple. Also keeping it simple. I considered doing a more complicated step mash but I think I’m just going to wade into the waters on this one and do a single infusion mash at 150 F.
There is really nothing to report from this batch of beer. It was well behaved wort and the total boiling time was 90 minutes. Chilled with the immersion chiller for 45 minutes and transferred to the carboy and wrapped in the sleeping bag shortly after that. I pitched the yeast when it was a little too hot though. If I were to change something I would wait for it to come to temperature to pitch. 1 ounce of Saaz hops at 6o minutes. Didn’t want to go crazy my first time out. Wort was fermented with WLP830. This is a strain of Saccharomyces pastorianus, the lager yeast. I grew up a 2 liter cultures, did a cell count and got about 310 billion cells. Most yeast calculators say this beer should be pitched with about 350 billion cells, so I’m close enough. This may be a slight underpitch but I honestly don’t care about that at all. Very slight and those calculators usually over estimate the pitch slightly. I pitched the yeast at 48° F.
Initial fermentation took place for 7 days at 54° F.
I started raising the temperature 3° F every day for several days until it was at 65° F. Once I reached 65° F, I left it for a few days so it would finish fermenting out. I started lowering the temperature by 5° F a day until it was at 40° F. I left it 40° F for one week. Transferred and force carbonated. It was pretty difficult to keep this thing at 40 F honestly. I may have to fine tune how I use this thing in the future. Is it expensive? Yes. Is it a luxury? It sure is. Do I care about people on the internet telling me I could have should have they would have done this cheaper? No. Keep it to yourselves. This little thing is cool, uses less energy than a lagering fridge and takes up basically the space of a single carboy. It solved a problem for me and my purposes, I enjoy using it, you don’t have to be my bookkeeper. As far as a first step into the world of lagers, I think I did a good job and this thing really helped out. Beer is yellow and has a slight haze to it. Nice soft white head of medium and small bubbles, decent carbonation although it could have used a little more. Aroma is sweet with a nice yeasty character. No sulfur, no diacetyl, no off flavors detected. There is a mild hoppiness there, it is mostly a clean slate of a beer. Beer is medium to light in body, wet finish, there is a mild off flavor in there…a slight corn but it is very subtle. It is really clean and crisp, great flavors, great mouthfeel. This is a winner for me. I think there is a lot here to be happy about and proud about. Definitely a nice starting point for lagers. I had no problem drinking this beer by a liter. Looking forward to additional lager experiments. Probably a boring post as there isn’t much to get excited about a Helles, but I’m excited since my first lager was a success. A more complicated mash schedule may be in the future for these beers. I don’t do step mashes often but I’m thinking I should try. Logistically that would be difficult on my system but I’m working out ways to do it. This was a training wheels beer for me and I’m fortunate it turned out so well. I’d love to do this recipe again but as more of an IPL (India Pale lager) but perhaps my desire to use up a bunch of hops is driving that decision, or my inability to conceptualize a beer that isn’t chock full of hops…who knows. I’m pleased with this as a starting point and will elaborate as quickly as I can. Well, my lager is done and I’m hooked. I want to do a Dortmunder, an Oktoberfest, and Kolsch….all of the beers. I’m in love with this thing. Obviously, there are more experimental hop beers and more other saisons coming up. Brewing saisons is how I mark time. I have a whiskey barrel aged Russian Imperial Stout I brewed last year that is carbing up in bottles right now. I can’t wait to crack that one, see how it turned out. My Old Ale (Stock ale) is in that barrel now. Brewing continues, always no matter what. I am headed down that path as well. Loves the lagers. Congrats on your first (proper) lager! Helles is yearly brew in my apartment; definitely a favorite. How do you like the brew jacket? 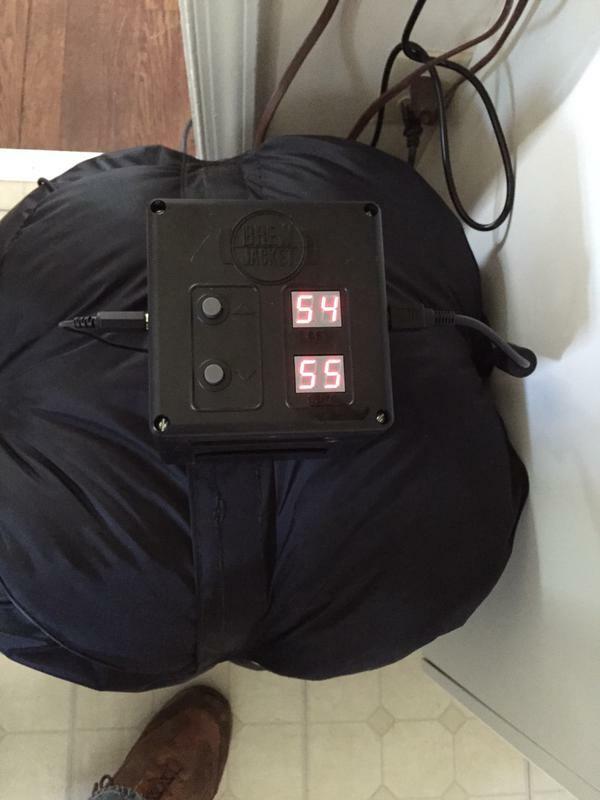 I use a temp-controlled chest freezer in my apartment brewing, but the brew jacket seems like a real space saver. Cheers! After the next one I’m going to write a post that is just a review of this product but I’d give it a B+….it is pretty neat and works almost as advertised. I can get about a 35 degree difference pretty easily. More than that it is hard to maintain. Nice post, I especially appreciated the background on the origins of the hybrid at the beginning. How long did you lager for? If you want to get that bright lager clarity you could consider gelatin fining in the keg during lagering. 1/2 tsp gelatin and 1/4 cup of 150°F water and you are golden. Thanks. I have gelatin I just never use it. I’m doing a Kolsch this weekend and I’m going straight at clarity, doing a protein rest, adding clarifiers, lagering longer / colder. I’ll see how it turns out. I never used to use it either. Once I realized how simple it was and how much of a difference it made (after all the fanfare from Marshall/Brulosopher on reddit) I gave it a shot. Works like a charm and saves weeks of cold conditioning.